No, I don’t mean this literally. Of course you are not a cup or elephant. I am just using this analogy to paint a picture of Truth versus Non-Truth. All things that cause negativity in our lives happens, and is rooted in non-truth. The engine that drives hardship, burden and pain comes from within our perceptions and conditioning. I always say – if it is negative, it is non-truth. All of the things that cause hardship or negative emotional reaction really only exists because we continually empower the engine that drives these feelings and experiences to us. The wonderful thing about non-truthful negatives is, they continually need energy nourishment to survive. If we cease to feed them, they die of starvation. So how can I stop feeding my negatives? How can I kill off the engine that drives these things? Simple – By seeing what is real as opposed to what our mind and past conditioning tells us is true. So here comes the cup and the elephant. If I showed you a cup and asked you what it was, you would be certain it is a cup and answer appropriately. Why? Because you know the truth about what a cup is. So if I told you the cup was in fact an elephant, you would not believe me. Why? Because you know the truth – that it is a cup. So it would not matter if I spent the next 10 years trying to convince you it was and elephant, my attempt at convincing you would have no effect. Except maybe you would get annoyed at me trying to convince you it was an elephant, knowing too well it is a cup. So what is in this analogy? Well, when you know the truth of something, the non-truth ceases to affect you. Regardless if the whole world tries to tell you that your cup is an elephant, it has no affect on you. why? Because you know the truth. This applies to all things. Once you know the truth of what causes your negative feelings and experiences, they no longer affect you. Truth frees you from your negative experiences and feelings. Truth is your “get out of negative jail card” for free. Something you need to know – “All Truth has a positive impact on your thoughts, feelings and life in general” Put another way – “All Truth Is Positive”. So if you feel, or are experiencing negativity or lack on any level, this tells you categorically that you currently believe something that is not true – you are believing the cup is an elephant. 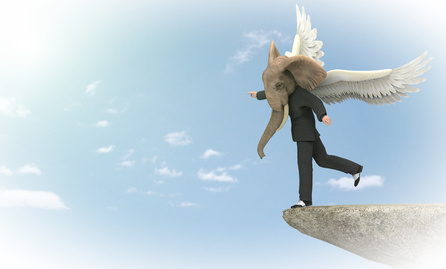 As a result, you try to resist, judge, change, or control the elephant, which only validates its existence even more, making you apply more energy and action to be free from it. You start to live an illusionary life believing in elephants and continually living in fear of one squashing you. This is living unconsciously, and is a very unloving way to exist. When you become aware of negativity in your conscious reality, acknowledge the truth of why it is there, simply – the only way I can feel this way is because on some level I am validating or believing in a non-truth that I believe to be true. This truthful validation turns your energy towards truth, thereby ceasing the feeding of your elephant. So if you want help killing off your elephants I would highly recommend you consider participating in my Personal Mentoring Programme. Regardless of where you live in the world you can do this great programme either in person at my centre in Sunnybank, Brisbane, Australia, or via skype or facetime.. This entry was posted in Uncategorized and tagged abundant life, contentment, happiness, healthy-living, how can I be happy, spirituality, stress, trevor gollagher, whats my purpose in life, yoga. Bookmark the permalink.